Looks like it might be too much of a restaurant but in fact does pretty well with four admittedly unexciting ales on tap. The big winner though is a £5 lunch deal from Monday to Friday which is of decent quality and unsurprisingly popular - I had belly pork with potato wedges and coleslaw. 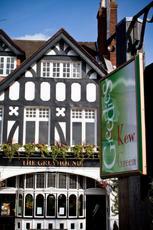 The location abutting Kew Green is also lovely while service was impeccable. Not a pub any more - moreso a restaurant with a coffee bar attached. Wouldn't advise going in just for a drink unless you want to get asked if you are eating every 5 minutes by a member of staff. Eye-wateringly expensive too. Was here for lunch a couple of Saturdays ago and had a lovely time. Table service, friendly staff, great food and well kept beer. Had supper and several pints here a week or so back. It is fun, it is simple, it is light and airy. The garden at the back is a haven. Loved it. Will return to enjoy more friendly faces are around.